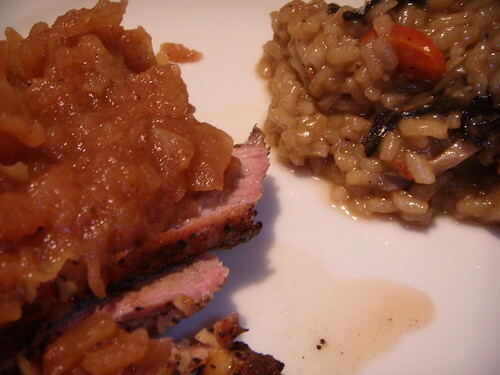 grilled pork loin and mushroom risotto, originally uploaded by aarn! +3rd June, 2008+. made a risotto with oyster mushrooms, black trumpet mushrooms, baby plum tomatoes, garlic, shallots, sun-dried tomatoes, chicken stock, and a pinch of romano cheese with a splash of sherry wine, served with a grilled garlic and pepper rubbed pork loin topped with a fantastic homemade applesauce (trisha! ).